Yesterday was very exciting as I was at OnStage in Auckland. It was also nerve-wracking, as I was giving a ten-minute presentation to showcase a new product. On Stage is a Demonstrator only event held to launch new catalogues and, in this case, also to celebrate Stampin' Up's 30th birthday. It's an event held simultaneously around the world with the main one this time being in Orlando and others held in Brisbane, Melbourne, Berlin, Paris, Birmingham and Utrecht. So it was a global event in that all centres followed the same programme and did the same activities in as close to the same time as possible. However, at each event local demonstrators are given the chance to do a Product spotlight - and this time it was me! Who knew that happiness and stressfulness could co-exist so well? 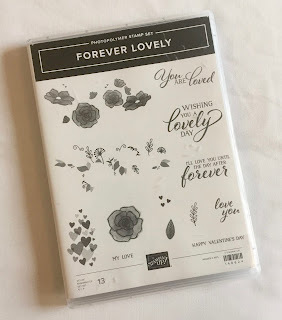 I was privileged to be able to participate in this way and was given a very pretty, romantic set called Forever Lovely. This will be available to customers in January. During the presentation, I had to show four cards. 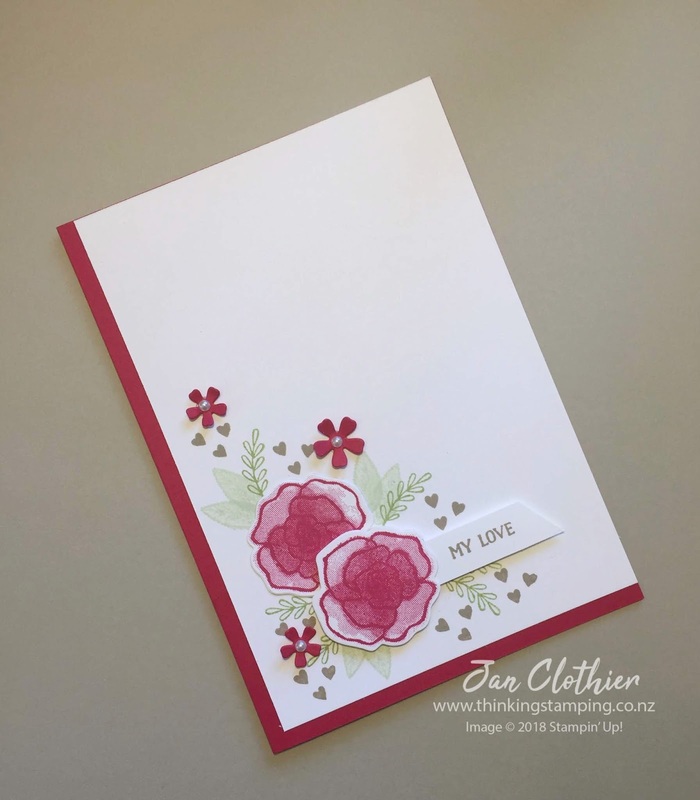 One had to be for an avid customer, who likes to craft and enjoys a challenge, so I made this pocket card that shows off the lovely two step floral spray and coordinating die cut. What a fantastic wedding card or invitation this would make! One card had to be for a casual customer - someone who just likes to come to class and make cards so I did this one, which you could stamp with a sentiment for any occasion: engagement, birthday, anniversary or just a hello to you card - if you aren't a Valentine's Day kind of person. 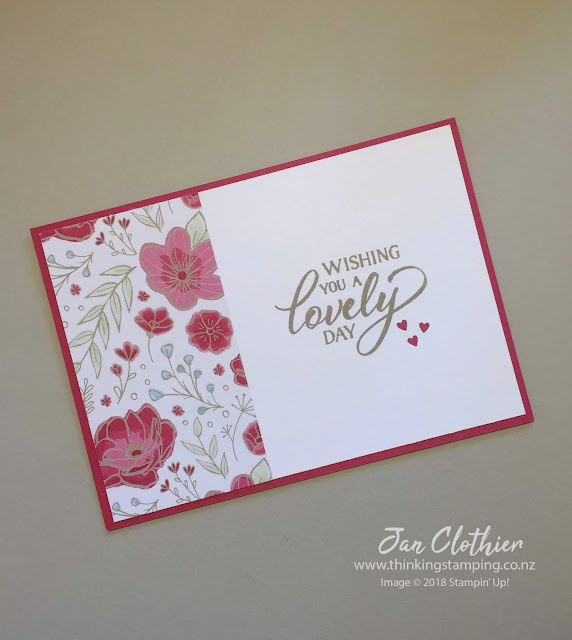 One card had to be for a beginning stamper - super easy and using only stamps, ink and paper. Wouldn't this make a lovely Mother's Day card? 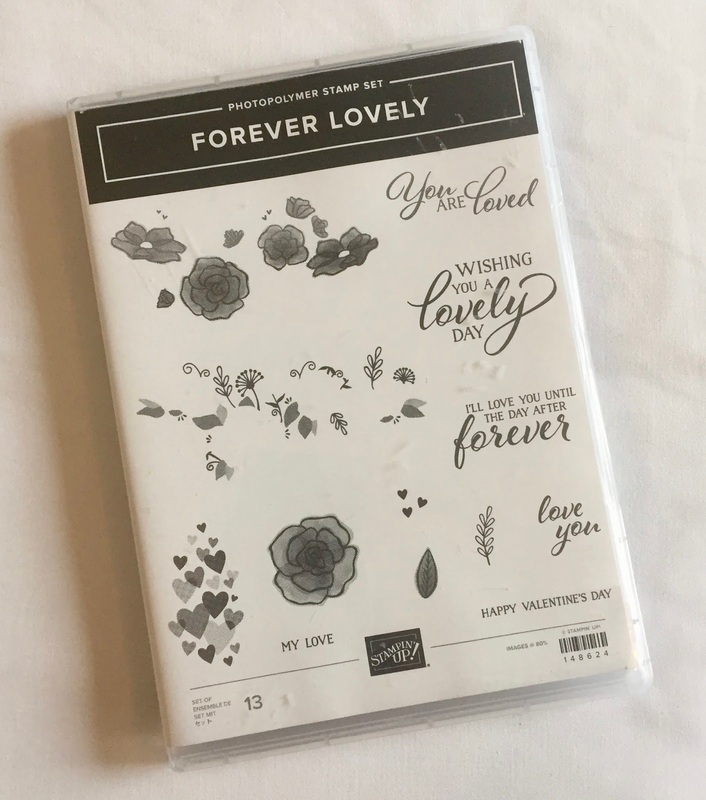 My last card could be one that I'd done that made me fall in love with the set, so I chose this one because I love all the extra die cuts that come with the Forever Flowers framelits. They're perfect for adding to layered clusters. 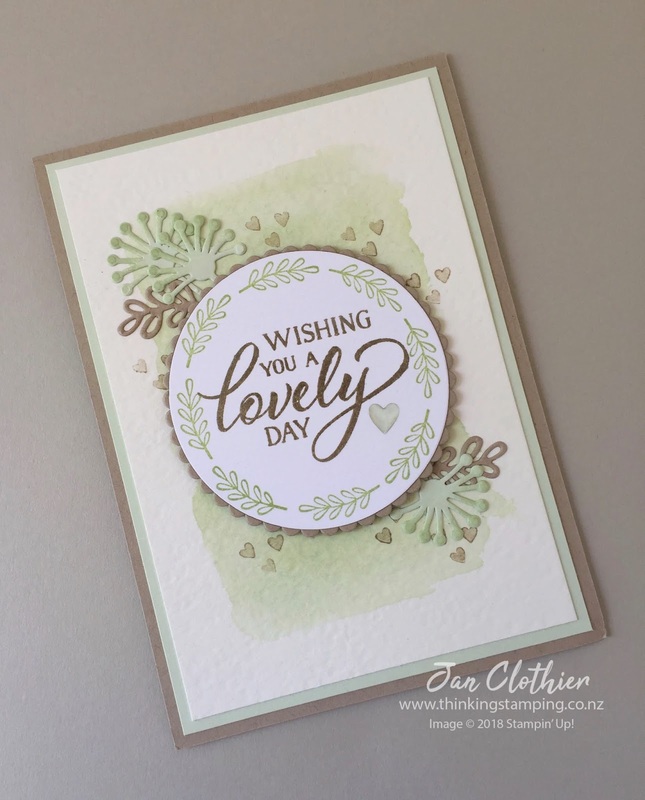 I love the way that sweet foliage stamp works perfectly to stamp in the round with Stamparatus and I thought the clear epoxy heart, coloured in with a Soft Sea Foam Stampin' Blend was a sweet finishing touch. 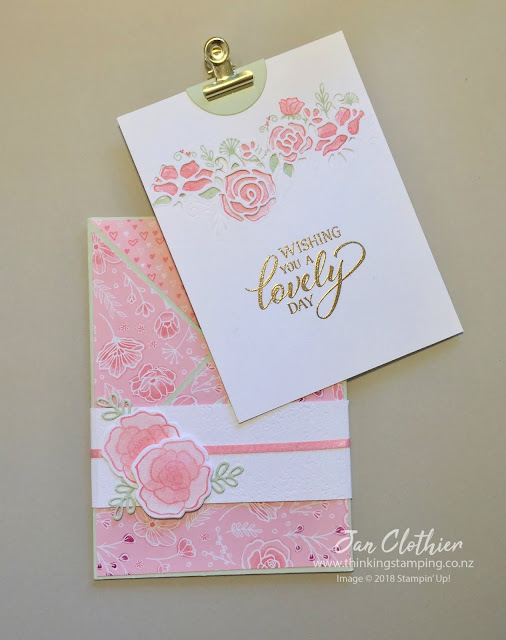 I also liked that this card showed you don't have to dominate a love themed card with pink and indeed, this card would work perfectly well as a birthday card or a pick-you-up/thinking of you card. 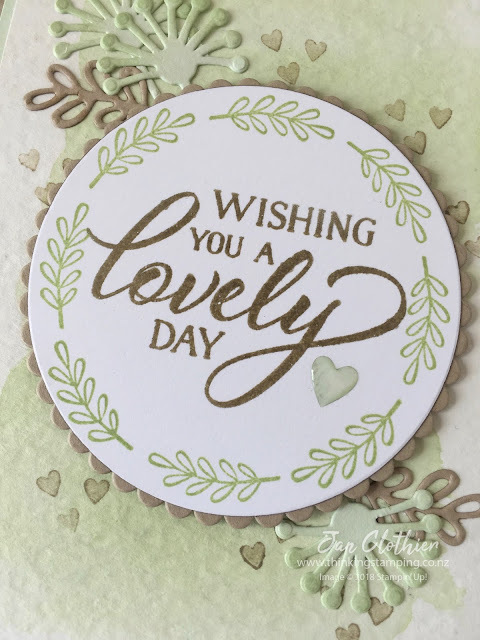 Since I was using Stamparatus with this card, I stamped the sentiment in Crumb Cake then overstamped it in Versamark and clear embossed it to give the sentiment a bit of shine. In addition to the four cards I showed, I submitted an extra six items for display. If you're liking the look of this set, I'll be showing some of the other items over the next few days. These are so lovely and show off the bundle beautifully, Jan. Congrats on your presentation & thanks for sharing them.